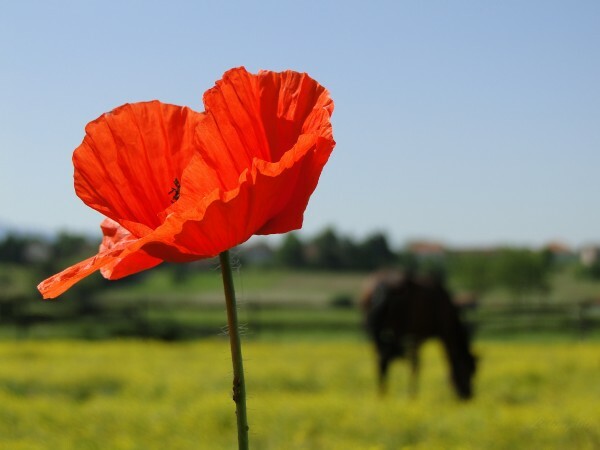 Poppy and Horse. By Lollipop. His name was Warrior, and he went to war in 1914 with his owner, a British general named Jack Seely. Both survived, defying even the horrors of the Somme. Warrior was celebrated as a hero and died in 1941, in the middle of another war, a few weeks short of his 33rd birthday. Although revered, he was not buried with the expected pomp and ceremony. Instead his body was donated to the war effort and used for meat. More then 5,000 years have passed since man first began riding horses. For much of that time the animal, now mostly associated with sport, was involved in war and military campaigns. Archaeological evidence confirms that the use of a bit began somewhere in what is now Russia. The invention of the wheel led to the introduction of the chariot, a vehicle that carried two men, one controlling the horse that pulled it, the other, an archer, fighting from a moving platform. Although nervous by nature, the horse made warfare faster. A mounted warrior had a huge advantage, giving riders the element of surprise. Horses also helped in reconnaissance and in making swift getaways after attacking settlements under siege. Through sheer size and an ability to kick and trample, the animals also intimidated anyone on the ground. Greek armies made use of horses, and the first manual on horsemanship was written by a cavalry officer, Xenophon. Trench warfare, gas attacks, barbed wire, machine guns and, from 1917 onwards, tanks would change the nature of war, but not before eight million horses, donkeys and mules had died. What about equines who were used in battle in the US alone? A variety of sources reveal the number of horses killed in certain battles, but there is no comprehensive figure, so we are still digging. What we noticed during our research, however, is that tens of thousands of horses were killed not only in battle as infantry horses but also on farms, for the same reason the enemy destroys houses, barns, food supplies and ammunition. Monument to the 1.5 million horses and mules that died during the Civil War erected outside the Virginia History Society in Richmond. While the number of men who died in the Civil War is estimated at around 640,00, more than twice that number, or a million and a half horses and mules, died during the same period. Source. Even taking into consideration the number of equine casualties in the Revolutionary and Civil Wars, the death toll is of course higher. That number does not include the horses who died in other battles fought on American soil. We remember and honor them all. To quell the Patriote Rebellions in the mid-1880s, the enemy pillaged and burned whole villages to the ground…and they absconded with over 800 horses, all purebred Canadiens (aka The French-Canadian Pony). The value of the horse was as good as currency…different eras, different values of a now-lost time. Would that we could revive some of that respect in today’s consumerist, use-and-discard culture. Horses are definitly not livestock! They are our companions, good friends and many times guardian angels in both war and peace. Thank you for this excellent, comprehensive article and posting in honor of the horses who “fought” and died in war. Little or no mention is given of horses and war and few memorials. This is mind-boggling. However, we who love the horse and know of their profound capabilities (intelligence, courage, perseverance, dedication to man…) are the ones to acknowledge this lack of recognition and sacrifice. They too paid the ultimate price in war. 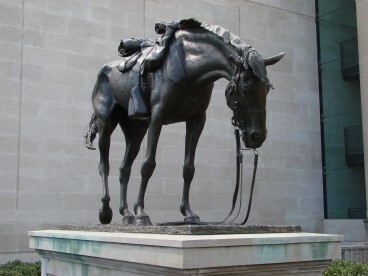 Most often the horse was the 1st target in war to disable the rider. Suffering and death from artillery, gas, disease, lack of food. Extreme weather, esp. WWI. Russia and Germany: horses freezing, deep snow, mud…hauling. Yes, we “forget.” American’s vision of the horse is settling America. Without the horse, it could not be done. Similarly, man depended on the horse in war. WAR! A horse is “livestock?” No. A horse should be heinously slaughtered for GREED. No. A horse should be subjected to cruelty in rodeos and racing? No. A horse is the most abused animal? YES!! To comprehend the unfathomed greatness of the horse, one only needs to see the Medieval exhibit at the Metropolitan Museum in NYC. The noble, majestic horse. Huge, covered from face to hooves in armor and chain mail. To view, one experiences visions of all the horse has meant, and continues to be, to mankind. At least this was my powerful comprehension, appreciation. Thank you. What a wonderful tribute Ronnie. Thank you for adding your comments. There was also an exhibition at one of the NYC museums a few years back that also had different vehicles horses pulled: an ambulance, fire wagon, milk cart, police wagon for hauling in criminals, and assorted carriages. People typically think that before mechanization, horses were out in the country, plowing acres of fields, and doing other farm work, and of course they were. But they were also heavily used in the city. We have used them everywhere. Thank You Vivian for this beautiful Memorial ………………..